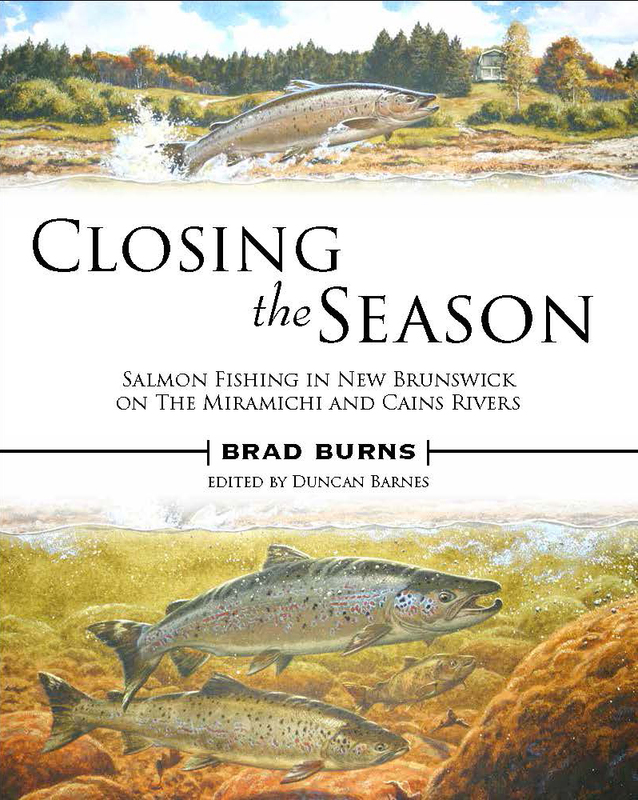 Closing the Season recounts an Atlantic salmon fisherman’s love affair with the world-famous Miramichi River and with the Cains, one of its most appealing autumn-run tributaries. Brad Burns, a well-known striped bass fly fisherman and author of the LLBean Fly Fishing for Striped Bass Handbook, first visited the Miramichi in 2002 and was quickly seduced by the challenge and the tradition of salmon fishing in this renowned New Brunswick river that is easily accessible but still unspoiled. Burns has done his homework and his writing about the history of the Miramichi watershed and how the Canadian system of managing salmon fishing on public and private water developed over the past 125 years is especially interesting. Along the way you’ll meet some of the salmon fishers who helped make it all happen – people like baseball great Ted Williams, Hungarian freedom-fighter and guide Willy Bacso, and pioneering Miramichi outfitter Charlie Wade. You’ll also learn about the near death of salmon sport on the Miramichi due to out-of-control commercial fishing and the re-emergence of the river as “big fish” water after conservationists were successful in pulling out the nets. A large portion of Closing The Season is devoted to the Cains, a small wild river with big salmon that arrive in the upriver camp pools towards the tail end of the season in late September and October. From the author’s journal notes taken on a daily basis for the last five weeks of the fishing year, the reader gets to share with Burns and his fishing friends the thrill of angling for salmon on their spawning passage upstream while enjoying the abundant resident and migratory wildlife and the changing look and feel of this pristine place as the brilliant fall foliage peaks and wanes and the Cains settles in for the long, cold, Canadian winter. Closing the Season offers more than 125 photos and illustrations including carefully researched old maps and other interesting historical documents. The journal also features some lovely original sporting artwork by John Rice (including the cover painting) that brings to life the long angling history of the Miramichi and the Cains. Brad Burns shares some very useful information about flies and other angling gear, along with anecdotal how-to that will be of interest to any salmon angler. But Closing The Season is most of all a celebration of the joys of salmon fishing in a great Canadian watershed that boasts the largest run of Atlantic salmon in North America. Just finished reading “Closing the Season,” and sorry I finished—the book, that is. What a fine job! I was almost tempted to skim Part I before diving into your Journal section, but that didn’t last long with the detailed, fascinating historical background and your relationship with it all. And the Journal— well, you truly nailed it; the country, people, water, fish, right down to your blueberry pancakes/bacon/eggs breakfasts. I love your routine. It’s a lovely job, Brad, and you should be truly proud of it.